And the winner is . . . Linda LaRoque! Congrats, Linda. Send your contact info to me and I'll pass it along to Mary. Thanks to everyone who participated. Stay tuned . . .
I’m Mary J. Dressel, and I write Historical, Paranormal, and Contemporary Romance. My most recent published works are part of a romantic time-travel series -- the Enchantment series. The idea for this series came from a little Victorian town I used to drive through to my vacation property in Pennsylvania. I started wondering what it would be like to live in this quaint little town a century ago. So, one night I sat down in my little cabin in the Allegheny Mountains, and I created my own idea of what it could have been like. No matter what I’m writing it seems that paranormal thoughts and ideas always want to come out and take over the story. For instance, my most recent contemporary work in progress is gnawing at me to do something out of the ordinary. I had to give in, adding a spirit that floated around a couple times! Another work in progress is a Vampyre romance, once again the paranormal called to me. Two more works in progress are also tumbling around in my head and soul, asking me to consider either time traveling or a something ghostly. It will be easy for me to write something ghostly since I had first hand experience with a ghost who lived in my apartment with me. I can’t say I liked the idea and it was frightening at times, although he never tried to hurt me or my roommate. Sometimes it felt like he was trying to cause trouble between us, and I can’t even explain how that all played out because it was so gradual. He was a young man about 19 years old. He wore a baseball cap cocked sideways on his head. He could speak in my voice, or my roommate’s voice, and he did this on occasion. One night I woke from a dead sleep to the sound of my roommate asking if I was awake. It wasn’t my roommate! He called me by the nickname that no one used but my roommate. That was spooky! Then one day he told my roommate it was time to get up, using my voice. I wasn’t home! That’s when he woke up and saw him standing in the bedroom at the doorway. Really, it was freaky. I could feel him standing near me while I pretended to be asleep, or he would bump into the side of the couch where I fell asleep sometimes. Once, I left the apartment because I was just too scared to be there. When we moved I told him it would be okay for him to find rest, and go where he was supposed to be. I hope he found peace. Unless you’ve experienced something like this, you don’t know what it feels like. So, I would say I have to add some ghostly spirit to something I write! I didn’t even know I could write paranormal stuff ‘till I sat down and wrote paranormal stuff! My first series of books are about time-travel. I suppose I write it because I’ve always loved the concept of time travel, but more into going back in time over forward. In my current series, my heroine leaves the past year of 1882, going through a Portal to the present time leaving her with no memory of a past time, of her family, or of the man she was betrothed to. Little did she know that Uriah followed her to the present time, waiting 20 years for her, twenty years plus a whole century, until a fateful foggy night brought her back to a town and man she didn’t remember. Picture this: You happen upon a quaint little Victorian town with a beautiful Queen Anne home called The Enchanted Inn. You need to spend the night to get in out of the fog because you’re terrified of it for some unknown reason. Okay, you know this could really happen. Right? But you walk in and the inn’s owner is familiar to you. Turns out you actually dreamed of someone with beautiful amber brown eyes, just like his, for the past 20 years. Through the past years this man never forgot, and still felt 100% in love just as if it were the same day you left. Eventually he tries to convince you that you loved him a century ago. Would you believe him? Would you believe him if his touch brought back memories of a past time you knew nothing about? And if you did believe him– what would you do about it? 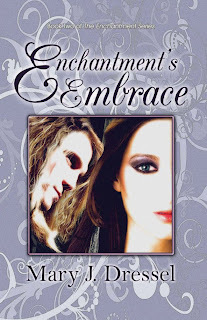 Visions of Enchantment and Enchantment’s Embrace tells the story of what could happen. If I had a handsome hero telling me things he told Eryn, and the visions and touch spoke the same, I sure would like a chance to see for myself if what he was saying was, indeed, true. I’m not sure I could take the chance of passing up the opportunity to take a trip back to the 1800's! Think about the questions I asked above, and feel free to leave a comment or question yourself. Would you time-travel if you could? Would you believe a handsome hunk/ beautiful heroine who told you, you loved them a century ago? How much time would you give him/her to convince you? What lengths would you go to, to convince the one you loved that he/she was from a different time period? I’m interested in finding out, so please leave me a comment! One lucky person leaving a comment will receive a pdf copy of either book! Good luck! I always answer my emails so if you would like further information about my Enchantment series, or other works in progress, please contact me at my email address or website. Or, if you want to ask about my 19 year old ghostly spirit with my voice! I hope everyone has a wonderful day! Happy traveling, no matter where you go. Thank you, Lynda, for having me here today! Mary's winner will be selected on Friday evening and posted here. Good Morning! I'm ready for a second cup of coffee, but ready to go! Welcome to Paranormality, Mary! Thanks so much for blogging today. Have a great one. Thanks, Lynda, I'm looking forward to this! I do know that I'd probably believe him. See, I'm open minded when it comes to things lie this. Especially if this person knew intimate details about me. It always bothers me when the heroine says, "But how can you know such things? You must have been spying on me!" Thanks for your comment! I know, there's just something about time travel that attracts my attention, too! Hi Mary I have lived with three ghost so I know what you experienced. No one will truly know how they can affect you if they have never lived with them. I'm glad that yours led you to write aspects of them into your stories. Three ghosts! Oh, my goodness. That one was enough for me. My husband always says he's going to come back and haunt me. I asked him if he would do it in front of anyone like Ghost Hunters International. He said, no, but it would definitely be at the most inopportune time! Yikes, that could be bad. :-0 Well, hmmm... maybe not so bad! I need to step out for a short time, but I'll answer any questions or comments as soon as I return! In the mean time feel free to check out my website or read my newest newsletter. And think about those questions I asked. Mary, I love reading ghost stories, but the idea of actually living in a place that's haunted terrifies me. Reading about your experience in the apartment gave me chills. As for time-travel, the idea fascinates me especially when there is a medieval or Victorian setting. I was totally blown away after discovering I shared my place with a ghost. I thought it was just me so I kept quiet about it, but made a joke about it one night, then my roommate mentioned it too. So, then the chills started! I don't want to live with another one, so I've warned my husband not to come back and haunt me. As far as the Victorian era, I fell in love with that era when I did research for my series. I can't wait to start the 4th book which will take place in that period. Thanks for your comment! I love lighthouses and the stories that go along with them. Michigan has more than 115 of these beautiful lights. For a time I traveled around photographing and climbing most of them. Many of them have stories of ghosts and hauntings. One of my contemporary works in progress is about a lighthouse keeper. Loving them the way I do, and knowing so many stories about them, I am excited to announce that I will be writing a lighthouse series. As it stands right now, I plan on them all being stand-alone books, not a continuing series. I just want to write different stories around the lights. That's something you can look forward to in the future. My first priority is to finish book 3 in the Enchantment series, then go on to the lighthouse romances. I can't wait to get going on this! We have a ghost. But he's never spoken to us. It can be scary at times. It might be a good thing that your ghost doesn't talk to you. It is scary. You said, "he" never talks to you. Have you seen him? What I mentioned in my post was the only times that he talked to either of us, that I recall. It was bad enough that he spoke, but speaking in our own voices was wayyyyyy to spooky! I hope my ghost found peace. I have a funny story from my book signing Tuesday. Well, funny to everyone ELSE there. I was reading an excerpt, the light was dim, it was written in italics. I forgot my reading glasses! I didn't have a problem reading regular text, just the italics. So, wouldn't you know I chose to read something in italics that night! Oh, how embarrasing... I stumbled over the words. Now, mind you, these are words that I wrote, and probably read a million times. I looked up at my husband and asked if he had any glasses. No, of course not! I had them in my bag, but if I went to the back of the room, dug thrugh my bag to find them, I think it would have just lost people. So, I stumbled through. On the way home my husband said he wished he had a video camera because I made my own blooper that night! I can see that he was already ready to send it to America's Funniest Videos! I'll never let that happen again! Yes, I did sell some books! Loved your real-life ghost story. I love the idea of ghosts, although I'm not sure I'd want to encounter one for real. I also have a time travel coming out with The Wild Rose Press, set during the Civil War. And I have a short vampire story, Eternity Waits out with them and am working on another vampire story as well as a ghost story. Love paranormal, especially when it's mixed with historical. I also write time-travels so thoroughly enjoyed your post and look forward to your stories. Your question about time traveling is intriguing. I guess in my younger years I might have given it a try - before I met my husband, that is. I love the Civil War era, and would love to do a book aroound that time, but UGH, the research! Congrats on your new book coming out. Nice to see you over here! Thanks for stopping by. I love that you would consider time-traveling, before you met your husband, of course! Writing time-travels is so much fun to me because you get to write historical as well as contemporary. Love it! I appreciate you taking time to comment. Well, Everyone, I must say I've really enjoyed myself here today. Thanks so much for all your comments and for taking the time to stop by. I hope I get to do this again sometime. Have a great rest of the evening, and if you leave any comments, I'll be back to answer them tomorrow. For now, good night, and Good Luck! I've enjoyed myself so much blogging here today! I know it's still early where you are, but not so early here where I am, so I will drop in tomorrow to see if there are any new comments. Thank you for having me here today! Since it's night here, Good night! The place that I'm renting is reported to being haunted. I've never actually "seen" her (from past tenents they say it's a her); however I've been told it has been on Unsolved Mysteries and had some unexplainable things happen during my stay here. Sounds spooky! It's Thursday now, so I will answer comments while they are here! If it's rumored there is a ghost where you live, then you know someone has seen her! Does the idea freak you out, or are you okay with it as long as you haven't seen it? I know my ghost did actually drive me from the apartment once. I don't remember what it was exactly, but it was just something, like he was following me all over the rooms, and just feeling like he was so close to me. You can feel the presence, and I don't want to feel that again! Thanks for stopping by to wish me a good night. Thanks so much for your great post and attentive comments, Mary! It was good to have you. I'll post your winner tonight. Thanks, Lynda, I enjoyed being here!